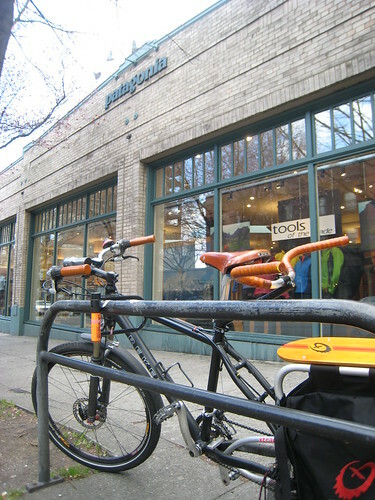 I had some stuff to return to Patagonia today so I rode downtown after I dropped the kids off at school. Since I was riding downtown anyway, Tim asked me to take a detour to his office and drop something off that he forgot this morning. So I took the route he usually takes to work. Man he is right about Eastlake and South Lake Union. What a mess. It’s really hard to believe the city lets developers get away with randomly closing lanes on well travelled streets. This one was really nice – right at the end of the University Bridge – no warning and barely enough room for one bike to get by. Good thing I wasn’t going very fast. Talk about Bicycle Neglect. (Read Alan Durnings latest series for more). I got my errands done and decided to ride through The Market before I went home. Pike Place Market is one of those touristy spots in the city that the locals love as much as the out-of-towners. Local farmers selling fresh produce and flowers, fish throwing, great butchers, yummy baked goods, funky art and crafts and excellent people watching. All and all a pleasant place to spend an afternoon. However, they really need to ban cars on that street. What a waste of an otherwise lovely cobblestone street. It could be so much more as a pedestrian and bike-only-zone. I’d even be happy if they just made it a pedestrian zone and installed more bike racks so you could lock up or just dismount and walk. I always wonder why anyone would choose to drive down there. There is never any available parking anyway so why not skip the headache of looking for parking and just park a block away and walk? I lived in Paris for six months in college and I just loved all of the pedestrian market streets – Rue Mouffetard, Rue Cler, Rue Daguerre – all pleasant stroll-inducing market streets. It was so nice to wander without needing to look over your shoulder every minute to make sure a car wasn’t bearing down on you. 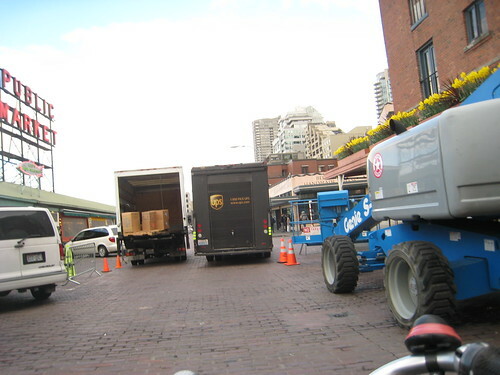 On pedestrian streets, they allow delivery trucks to enter only in the early morning and in the late evening so businesses can get their deliveries. The rest of the time, cars are not allowed. It doesn’t seem like it would be that hard to do the same at Pike Place Market. Banning cars would really alleviate this mess and make it a really nice pedestrian zone. Ah, I digress again. Oh no what’s happening? I’m supposed to be the positive one of our duo. I think Tim might be rubbing off on me. Ranting aside, biking is always better than driving. I love riding my bike everywhere. It’s such a great way to travel. It’s even more pleasant to ride while listening to some good tunes on a semi-sunny day without kids weighing me down. After my Market cruise, I rode home via Westlake, Eastlake and through the U District making a short detour in Cowan Park to chat with a friend. What a beautiful way to spend the day. This entry was posted in alternative transportation, bikes, extravehicular activities, Human Powered Politics, neighborhoods, seattle, xtracycle and tagged bikes, Downtown Seattle, pike place market, xtracycle. Bookmark the permalink. Yeh! Right on Sister! We have some great outdoor markets here in Darwin. There’s a food market on Saturdays where people come to just sit and eat and hang out. It is very popular and the location would be fantastic if only they could block the street for a couple of hours. The market is held in an Island in the middle of the street and with drive through car parking on either side, so everyone is huddled and squashed into a tiny space in the middle just so people can have the luxury of parking their cars close to the shops. It’s quite dangerous and annoying. I don’t get why cars take priority over people. Okay, it seems that it wasn’t London, but Nottingham, which has a Clear Zone at the city center ( http://www.nottinghamclearzone.com/ ) which looks like a great idea. The courier company that works in symbiosis with this plan is Pedal Express ( http://www.thebigwheel.org.uk/index.php/business/business_pedal/ ). Wasn’t there a handful of stories about the tragedy of the vanishing bicycle couriers ( http://bikesnobnyc.blogspot.com/2008/02/this-just-in-save-messengers-campaign.html )? A plan like this could rejuvenate the courier industry, as well as improving the downtown environment. 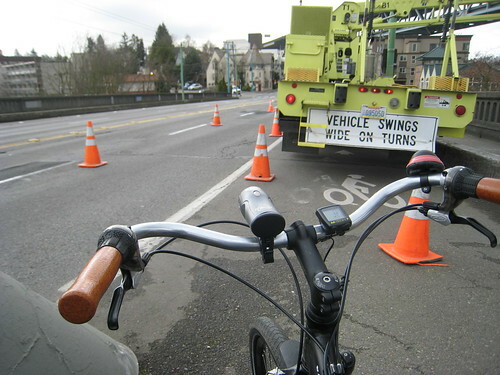 I feel sorry for Tim if he has to bike on Eastlake as part of his regular commute, it is insane! All the gravel trucks with trailers bearing down on you. I agree the Market should be closed to motor vehicle traffic, I have even cautioned tourists about not driving down there, because as you say, they are just going to get stuck, and there is no place to park.